I’ll admit to being among the more surprised of people when the major budget deal between the Congress and the president was announced. So, what now? 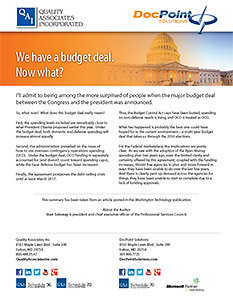 What does this budget deal really mean? First, the spending levels included are remarkably close to what President Obama proposed earlier this year. Under the budget deal, both domestic and defense spending will increase almost equally. Second, the administration prevailed on the issue of how to use overseas contingency operations spending (OCO). Under the budget deal, OCO funding is separately accounted for (and doesn’t count toward spending caps), while the base defense budget has been increased. Finally, the agreement postpones the debt ceiling crisis until at least March 2017. Thus, the Budget Control Act caps have been busted, spending on non-defense needs is rising, and OCO is treated as OCO. What has happened is probably the best one could have hoped for in the current environment—a multi-year budget deal that takes us through the 2016 elections. For the Federal marketplace, the implications are pretty clear. As we saw with the adoption of the Ryan-Murray spending plan two years ago, even the limited clarity and certainty offered by this agreement, coupled with the funding increases, should free agencies to plan and move forward in ways they have been unable to do over the last few years. And there is clearly pent up demand across the agencies for things they have been unable to start or complete due to a lack of funding approvals. This summary has been taken from an article posted in the Washington Technology publication. About the Author Stan Soloway is president and chief executive officer of the Professional Services Council.